This past August, Elizabeth and I took a last minute weekend trip to Disney World. We arrived late Friday night and had to leave for the airport at noon on Sunday. By now you may have noticed we like to squeeze in as much fun as possible when traveling. 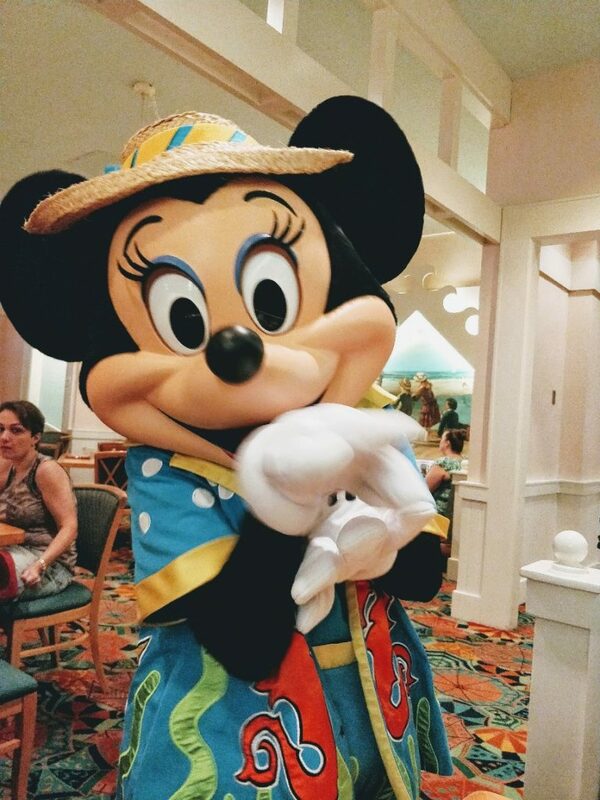 For this reason we booked a Cape May Café breakfast with Minnie (A.K.A. Minnie’s Beach Bash Breakfast) for our departure day. I’m so glad we did! Cape May Café is located inside Disney’s Beach Club Resort near Epcot. An extensive breakfast buffet is available for Minnie’s Beach Bash Breakfast. 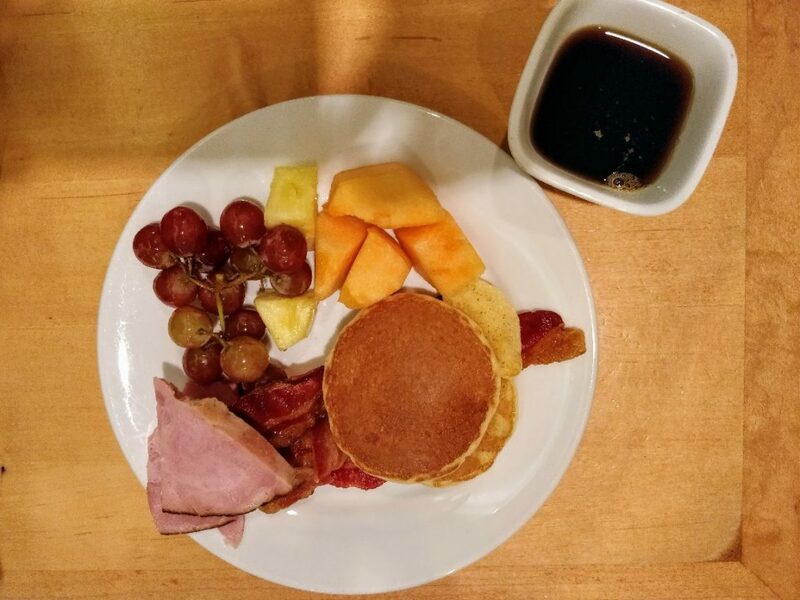 The buffet had the usual assortment of scrambled eggs, pancakes, Mickey waffles, fruit, yogurt, breakfast potatoes, bacon, and pastries. There was also a carving station that served ham the morning we went. My favorites were the seasonal berry pancakes and the egg, chorizo and cheese scramble. They were both so good! Elizabeth’s favorite was the regular pancakes. I thought the food quality was good during our breakfast. My biggest disappointment was that some of the more popular items did not get refilled quickly. In fact, I had to stalk the berry pancake replenishment – don’t judge. Since Elizabeth has a food allergy (find out more about dealing with food allergies at Disney), the check-in staff provided a special menu to us. 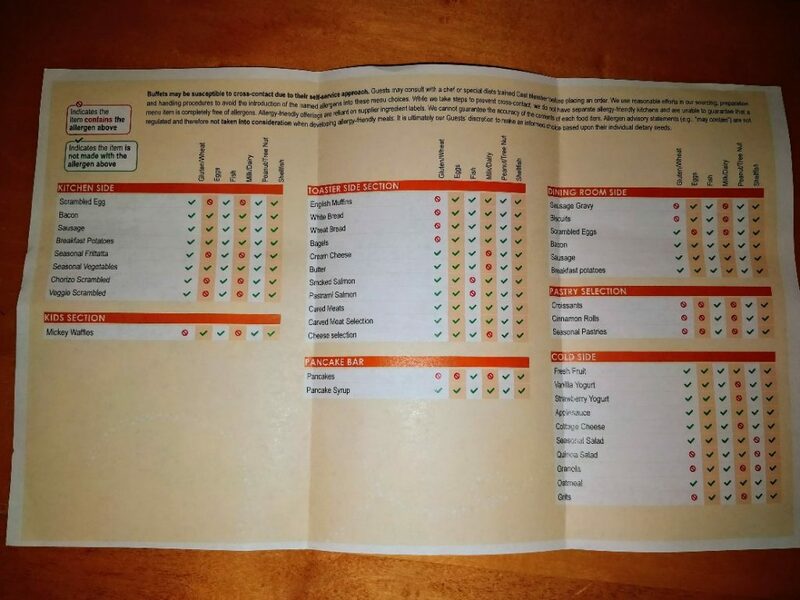 This menu provides information about the most common food allergens. Elizabeth is allergic to corn which is not one of the most common ones. I asked for the chef to come to the table and discuss safe options. As usual, the chef was amazing. He was able to find many items that were okay for her to eat. There are generally three characters at the Cape May Café breakfast: Minnie Mouse, Donald Duck and Goofy. Please note characters are always subject to change. Despite our table being awkwardly placed (a small booth in a narrow walkway between the buffet and kitchen), all three characters went out of their way to make our interaction fun. Minnie Mouse loved our Minnie inspired manicures and made sure to “tell” us. Donald, of course, reassured us that he is number one. Goofy was silly and hopped around making funny poses. We enjoyed Minnie, Goofy and Donald’s beach inspired outfits (which are unique to this venue at Disney World). The characters did well with interactions despite our table being a challenge. The food was better than I expected, but not great (except for a handful of items). If we’re being honest, for me the food is often a secondary focus when choosing character meals. I don’t usually go into it expecting a high quality meal, although I have had pleasant surprises in the past. The Cape May Café breakfast felt very relaxed, unlike some other character meals where we’ve felt rushed. I really liked this chill vibe especially since this was the main event of our morning. We both had a good meal and a lot of fun at our Cape May Café Breakfast. If you happen to be staying on-site at Disney’s Beach Club, or nearby at Disney’s Yacht Club or Boardwalk Resorts I would certainly recommend this breakfast. 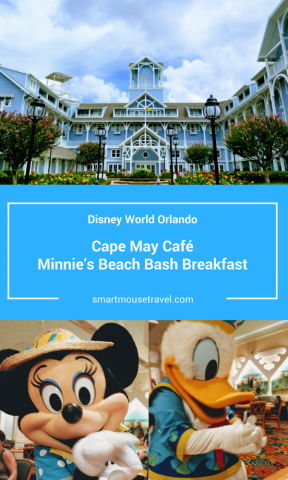 The Cape May Café breakfast is also a great back-up option for meeting 3 of the “Fab 5” if you are unable to get the much coveted Chef Mickey’s reservation. 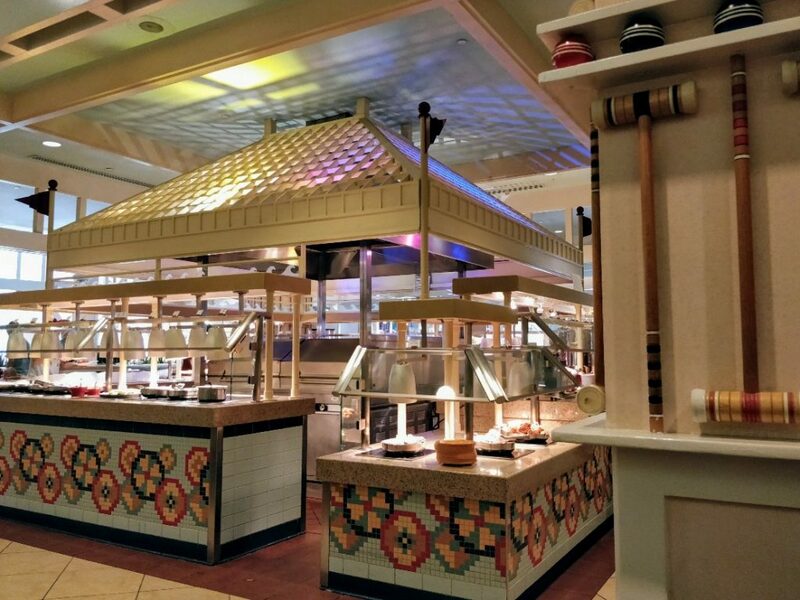 Want to know more about Chef Mickey’s? See what Momma To Go thought of their meal there. 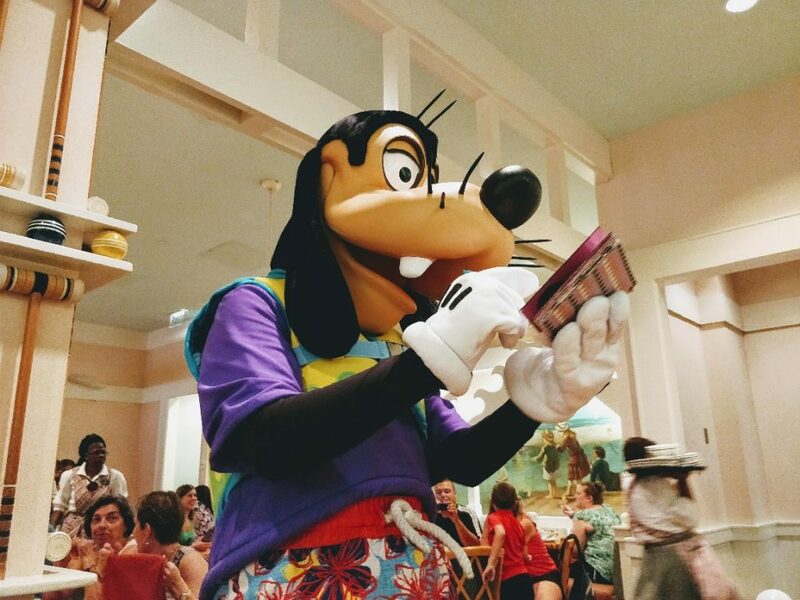 For those staying at other area resorts, you may prefer to meet Minnie and Goofy without paying for a meal (or managing hotel to hotel transportation). A FastPass+ for “Meet Disney Pals at the Epcot Character Spot” will even let you skip the line. Mickey, Minnie and Goofy are generally available for meet and greets here (although they will be dressed in their regular attire – not beach gear). Our Cape May Café breakfast was the perfect way to do something entertaining before leaving for the airport. I am so glad that there was a last minute Advanced Dining Reservation so we could have a great end to our weekend trip! yes we have done chef mickey and it sounds like very similar food but more characters. But I do like the beach theme of this! cant wait to get to orlando this winter! I love character meals!! We don’t usually go for the food either. 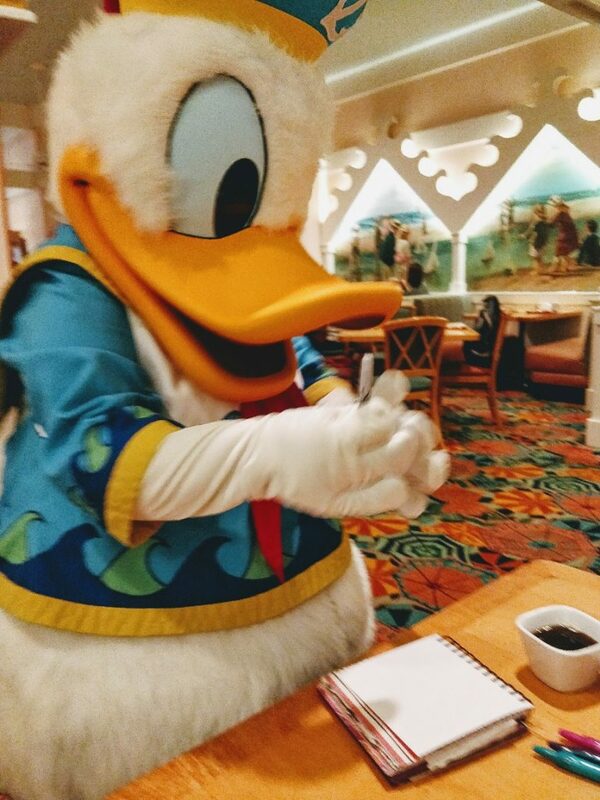 I love being able to meet characters and do dining at the same time. It saves us so much time waiting in lines for meet and greets at the parks.